I'm facing a problem with my MF4750 printer. I want to know how to scan a number of pages at a time? May I ask how I change the toner for my Canon MF 4750 printer because it's almost run out? Thank you. I'm facing a problem with my Canon MF4750 printer. Since refilling the cartridge it's now working too slow. What can I do to get the machine working better? Unfortunately, we're unable to provide technical support fpr printers. Please refer to your Canon MF-4750 printer manual for troubleshooting advice or contact Canon directly for technical support. The i-SENSYS MF-4750 is an upgraded version of the previous multifunction model from Canon's i-SENSYS series. It offers all the same features plus high speed faxing. The MF-4750 now combines four machines in one, able to print, copy, scan, and fax from a single, compact, and easy to use unit. However, this device still lacks colour-printing capabilities and it has limited connectivity options. The Canon i-SENSYS MF4750 is perfect for desktop operation, measuring only 39x44x36 cm. It has an internal memory capacity of up to 128 MB, which allows quick data processing. The unit has a 250-sheet input tray along with a manual feed slot for thick and odd-size media. 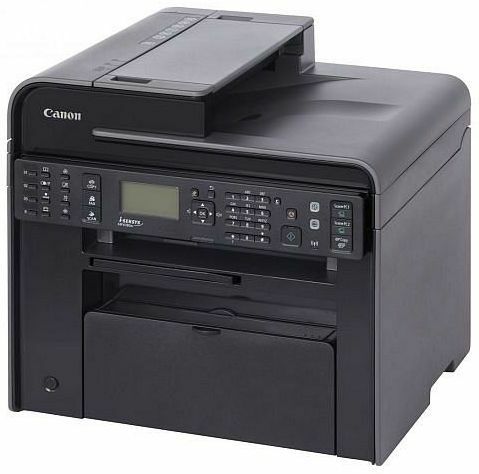 The Canon iSENSYS MF-4750 even has an automatic document feeder for easy handling of multiple page originals and connectivity is via high speed USB. The best feature of the Canon i-SENSYS MF-4750 is the fax component, which features a 33.6 kbps super G3 modem, a memory of up to 256 pages, and up to 103 speed dial entries and 113 sequential broadcast locations. The unit still offers fast copying and printing, as well as high-resolution scanning. However, the Canon i-SENSYS MF-4750 lacks colour printing capabilities and does not offer networking, which puts it two steps behind other competing models that offer not only colour printing but network and wireless connectivity as well. Print speed is not as impressive, but at 23 ppm, it is good enough for light duty print work.